We have no time for bullying, no time for stigma, and no time for the negative. THANKS TO SUPPORTERS LIKE YOU, we've been able to deliver Over 600 presentations about bullying prevention, mental health awareness, and youth empowerment to schools across Canada free of charge and have directly impacted over 150,000 students. 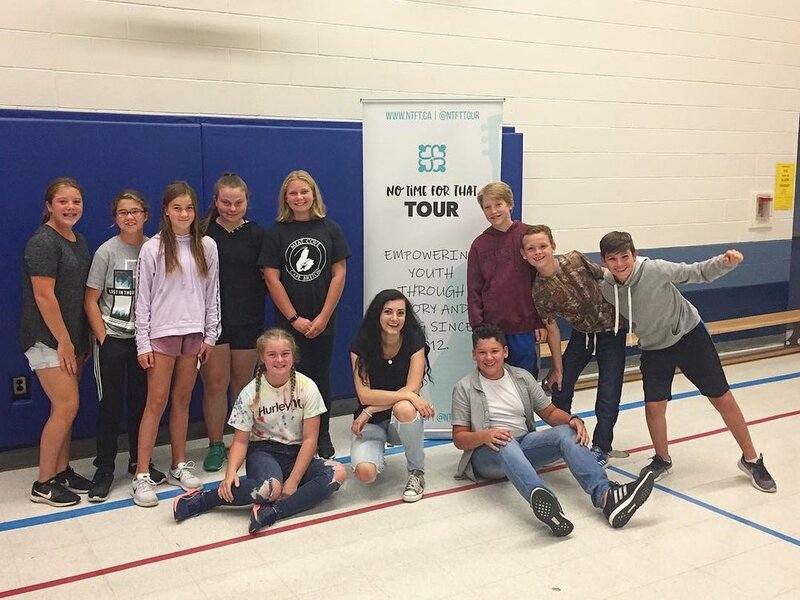 The “No Time for That” Tour presentation with Elsie Morden is a professional 45 minute interactive presentation about bullying prevention, mental health awareness, and youth empowerment that includes speaking, live music, video, and volunteer activities. There is a 15 minute Q&A period afterwards. Our founder and performing partner Elsie Morden shares her own experiences with bullying and mental illness through original songs and personal stories. Elsie is an ambassador for Kids Help Phone. This past fall, we continued our efforts of making a difference in Canada. We visited 100 schools in 10 provinces across the country over the course of 14 weeks. We have done 617 presentations so far including school visits, follow up sessions, break out groups, and community events for all ages including parents and the public! The presentation is always free of charge. "The “No Time for That” Tour was engaging for all students, with a range of stories, visuals, and music that offers something for everyone. Elsie was relatable, energetic and youthful, and helped create a ‘safe environment’ for students to participate in. The messages were important, empowering and, most importantly, uplifting! We’d recommend this experience for anyone wishing to explore bullying, self- care and coping with conflict, as these are universal messages for all!" "The “No Time for That” presentation paints a vivid picture of the bullying she endured as an adolescent that resonated in the minds and hearts of our students. Through personal vignettes along with her music and kind heart, she explains that we all need to stand up against unkind acts. We need to embrace and reassure our self that we are good so that we can develop and maintain a healthy sense of identity. She also explores ways that she combated anxiety, depression and other barriers to personal acceptance. You need to make time for “No Time for That” anti-bullying presentation by Elsie!" Are we visiting your city? If so, you can help fund our visit to a school near you. I’m the CEO and Founder of the "No Time for That" Tour. Standing up and singing on a restaurant table at the age of four was the beginning of my journey as an entertainer. Since then, I've always known deep down that I wanted to be a performer. However, it wasn't until my mid-teens that I discovered my true passion for music and public speaking. Growing up, severe and relentless school bullying was a daily struggle . Being made fun of for my curly hair and good grades, getting called mean names, and being continuously left out are only a few of the unfortunate things that led to the destruction of my confidence and self-esteem. I would always ask myself 'why me?' I didn't understand why I wasn't good enough. I dreaded going to school, I was so afraid of what would happen next, and by the end of the day I usually found myself crying. The bullying turned into a vicious cycle that I thought I would never escape. After I was punched in the face, I realized things needed to change. Despite the overwhelming hard times and an ongoing battle with depression and an anxiety disorder, I refused to accept defeat and eventually gained the strength to pull through; only becoming more driven than ever to rise above it all. I found myself turning to music. I would pick up the guitar we had at my house, and I'd start strumming while scribbling my feelings and thoughts down in notebooks. I realized that music was my outlet, it is what makes me happy. Writing and performing is what I love to do, and nothing or no one can take that away from me anymore. I know how alone, misunderstood, and hurt I felt when I was being bullied, and I also know that there are thousands of others feeling the exact same way I did. No one deserves to feel that way. Six years and 617 schools later, I've been able to directly impact over 150,000 kids across the country – and I'm just getting started. You need to, you have to, find that thing or the things in your life that make you happy - the positive, what you love to do, and focus on that. Follow your dreams and surround yourself with people who are going to support your dreams, people who care about you, and accept you for who you are. Don't let people or things bring you down because it is not worth it! I've learned that it's okay not to be okay. Yes, I have some really bad days, but I also have really good days, and those good days are the days worth fighting for. Positivity is key and so is self-love. I have the strength inside of me to get through absolutely anything, and so do you - never give up! Silver necklace chain with a charm handmade by Amos Pewter. The front of the charm has "Never Give Up" engraved in Elsie Morden’s handwriting and the back has the charity's logo. White sock with teal semi-colon symbol on the top of the sock and "Step Above Stigma" on the bottom. Black t-shirt with a photo of Elsie Morden on the front and a list of the 2018 "No Time for That" Tour cities on the back. Available in 7 sizes. A white rubber wristband with "never give up" and the charity logos debossed. Elsie Morden promo photo on a guitar pick! The original songs performed at the "No Time for That" Tour presentations. Includes album insert booklet. White t-shirt with a square photo of Elsie Morden dancing in confetti on the front. Available in 7 sizes. Alex and Ani style bracelet with a charm handmade by Amos Pewter. The front of the charm has "Never Give Up" engraved in Elsie Morden’s handwriting and the back has the charity's logo. A white guitar pick with "Never Give Up" written on the front in Elsie Morden’s handwriting. White guitar pick with the "NTFT Tour" logo. Elsie Morden's debut, full length album. She wrote all 10 songs herself and co-produced the album. It is 100% Canadian made. Includes album insert booklet. White t-shirt with "Never Give Up" written on the front in Elsie Morden’s handwriting and a fabric tag on the bottom with the charity's logo. 5 sizes available. Elsie Morden album cover photo on a guitar pick! A special poster of Elsie Morden signed by the star! 8" x 10". A special poster of Elsie Morden signed by the star! 11" x 17". A keychain with a charm handmade by Amos Pewter. The front of the charm has "Never Give Up" engraved in Elsie Morden’s handwriting and the back has the charity's logo. We hope you enjoy this report that reflects on our growth and impact over this year while looking forward to new opportunities! Thank you so much Kirk Starratt for such a well written article about our cause. Back in the Annapolis Valley! We put on a hockey game fundraiser with the Montreal Canadiens Alumni team! We have launched our “Never Give Up” line of merchandise! We are so excited to be partnering with 4 Modo Yoga locations this fall to raise funds for our “No Time for That” Tour! 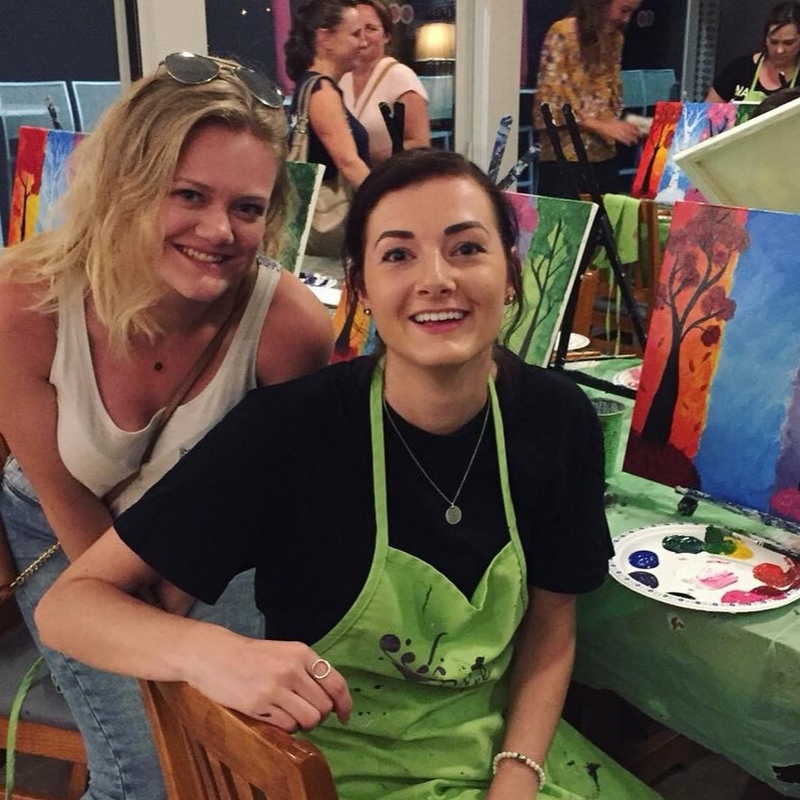 Thank to everyone who came out to our Brush Away Bullying Paint Nite! Mud Creek Rotary recognized Elsie Morden as an official Honourary Rotarian! Sign up with your email address to receive news and updates about our upcoming events and tours.